The Maldives is famed for its rare underwater beauty. The profusion of psychedelic colours and the abundance and variety of life underwater have fascinated divers and snorkellers since Maldives was discovered as a diving destination. The highest level of visibility that one could expect- sometimes exceeding 50 meters - and warm temperatures throughout the year makes diving in the Maldives a delight you would want to experience over and over again. The Maldives has some of the best dive sites in the world and many visit the Maldives repeatedly for the sole purpose of diving. In the early morning hours of 13 February 1981, a Friday, this 35,000-ton freighter ran at full speed onto the southern tip of the island of Hulule - the airport island near the Capital. Panic spread through the island when it became known that the long-awaited foodstuffs and building materials were lying on the bottom of the ocean. Shaped like a banana, this reef stretches from North-East to South over a length of some three hundred meters. Nearby resort islands include Fullmoon Island, Club Med and Kurumba. Ever since scuba divers began to dive in this part of the North-Male' Atoll, twenty years ago, Banana Reef has remained an ideal spot. A favourable feature is that since the fish show absolutely no fear of photographers on this reef, one can take excellent shots. However, together with the strong current and the fragile reef it makes anchoring your boat not always an easy task. You are requested to be careful not to damage the fragile reef when anchoring your boat. As the name suggests, encountering and observing sharks at this point is a frequent and regular happening. They swim to and from at the end of the channel where the currents are strongest. Friendly Gray reef sharks and whitetip reef sharks are those most likely to approach the divers. 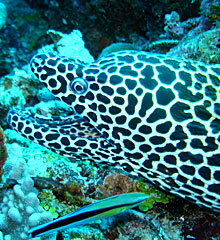 Barracuda Giri lies in the North Male' Atoll, North - Northeast of Bandos Island Resort and South -Southeast of Thulhagiri Island. 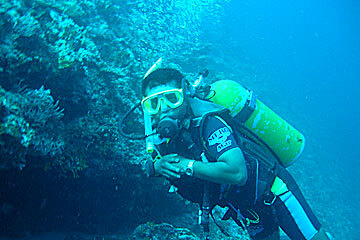 Barracuda Giri boasts some truly spectacular dives. Life forms include large schools of black spotted sweetlips, schools of large batfish, black coral, barracuda etc. Manta Point, which lies in the northern section of the channel leading out of the Ari Atoll, is - as the name suggests - an ideal place for close encounters with Mantas Rays. From December until the middle of April, the Mantas are regulars at this site, the topography and the location of the site making it an ideal habitat for all species of fish that live on plankton.